A cruise certificate is a way to provide an all-expenses-paid award covering lodging, meals and entertainment. All costs can be covered up front ensuring the recipient doesn�t incur additional expenses. Your cruise promotion can include pre-paid shore excursions like golfing, tours, snorkeling, and more. Basically, anything the passenger can do while in port. Shipboard activities can be included as well, most ships offer salon/spa services. The cruise promotion theme could be �5-Night Golf/Spa Cruise� for instance. We offer two types of cruise certificates. We have the cruise gift certificate which includes all services pre-paid including; berth, meals, taxes, and port charges. We offer a cruise gift certificate where the recipient is responsible for port charges, taxes and a processing fee. The advantage of using the cruise gift certificate where the recipient has to pay the taxes, port charges, and fees, is price. A cruise certificate where the recipient has to pay the taxes and has to cruise during certain off-peak periods is much less expensive. These are often used as consumer incentive cruises. Consumer incentive cruises usually cost less than $100 and can be given away to anyone who closes a loan, buys a car, has remodeling done, etc., where the cost of a pre-paid cruise would be prohibitive. 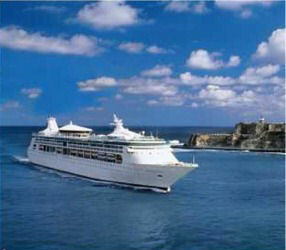 Call us today, we will help you determine the right cruise promotion for you company.